Congrats, I hope you really enjoy your package and get it before the holidays! Thank you everyone who entered, I really enjoyed reading your entries and I will take your advice into consideration. 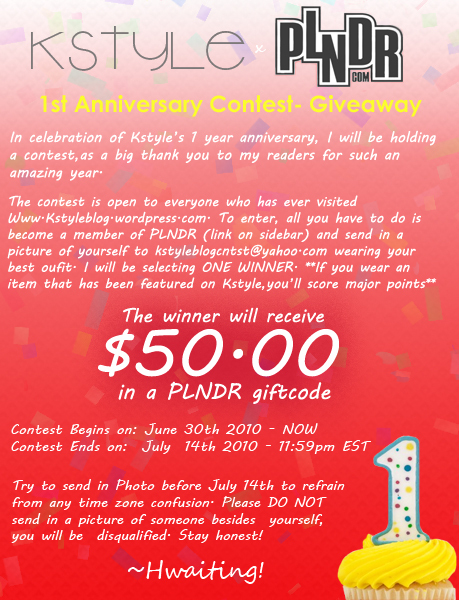 Kstyle’s 1 year Anniversary Contest is now Closed. Special Thanks to all the participants, you’re outfits were really fresh! It’s going to be really hard to choose. Though I will decide and choose one winner on July 15th and after doing a few things here and there I will announce the winner on Kstyle hopefully soon. I occasionally get my daily dose of Hellz Bellz through their blog What the Hellz?! Brittany of Hellz Bellz featured my Sooyoung is a fan of Hellz too? post was on the blog. Isn’t that cool? Kstyle wasn’t tracked backed, but it’s ok.
I’m glad that the people who hold it down at my favorite brand have checked out my site. I am one happy camper right about now. I love this tutorial! I wore this look to school before, but I think it was a total fail. This gave me hope to try it again. I’ll post pictures if I do this look, you should too. Just send them to my email:Kstyleblogcntct@yahoo.com. I’ll post them on the site. Speaking of fresh ideas. I will try to post funny video cuts of our favorite celebrities weekly/daily to keep Kstyle a happy atmosphere. I chose this video, because well…it speaks for it self. Kyuhun & Siwon’s face + Leeteuk’s cackling make everything funnier. Street Fighter*sigh* Brings back childhood memories, right? Time sure does fly.